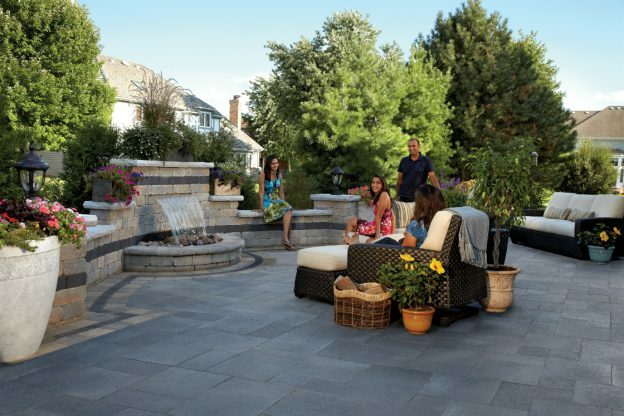 As you identify features that you must have for your paver patio in Walpole, MA, consider who will be using the space and how that space will be used. Essential inclusions will differ depending upon these factors, but certain features are pretty comprehensive and should be part of any paver patio design. Beyond easy maintenance and durability, these factors deal with aesthetics and functionality of the patio itself. 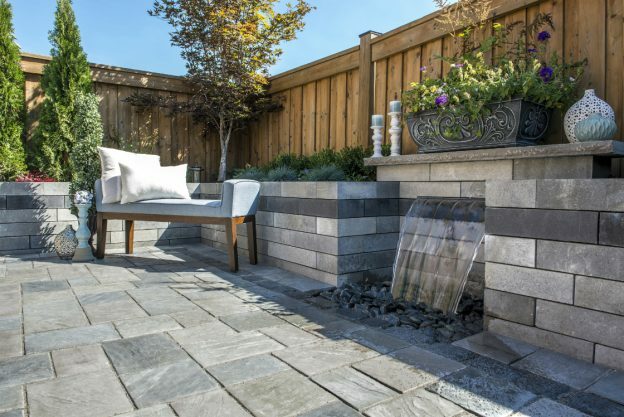 While you may pack away the outdoor furniture during autumn and leave it there until spring, planning to include seating walls as part of your patio paver will provide permanent seating for outdoor endeavors during the cooler months. In addition, these walls offer a resting spot for planters and the added enhancements of privacy and wind protection. The aesthetic value is clear when the materials used complement the pavers chosen, and when connected to the home as well, the overall effect is quite remarkable. Functionality should be a given for your paver patio. The completed project should be durable, easy to clean, and appropriate for your property. However, it should also be visually interesting, complementary to your property, and fitting for your personal preferences. Consult a landscape design professional for assistance with design intricacies. One of the primary advantages of choosing pavers is the ability to create patterns, include borders, and sprinkle in accents throughout the design. Avail yourself of this benefit and allow a professional in the field to assist with the design. Another element that you should definitely consider when planning your paver patio is the accessibility it allows to both enter and exit your home, as well as the surrounding landscape. The location should also pay specific attention to the proximity to the kitchen door if you’re designing an outdoor kitchen, the best view from your property, and the view of your property from every direction. This comprehensive scope will ensure lasting satisfaction with the design. Underestimating the appropriate size of your paver patio is a common mistake, but fortunately, it is one that can be easily avoided when you work with a professional during the design process. In general, designate the various purposes of your patio, identify the furniture that will likely be included, and estimate a standard amount of space for the furniture, physical movement, and comfortable living space. Finally, your paver patio should have a clear focal point to which the eye is drawn immediately. This can be a statement-making piece that ties together your shape theme or design style. Whether this feature takes the form of a design in the patio itself, an impressive outdoor fire feature, an interesting and remarkable planting, or even a wall mounted waterfall, the choice is really up to you. However, yet again, you shouldn’t underestimate the power of assistance that a landscape design professional can provide. When choices are abundant, an expert eye and ear can be immeasurably helpful to the process. This entry was posted in Design & Construction and tagged Concrete Pavers, Focal Features, Landscape Design, Patio, Seating on October 28, 2017 by 12850420. Even though we are talking about a relatively small space, dividing it into two or possibly three separate areas can actually make it seem larger. The trick is simple, creating separate spaces for different experiences means making fuller use of the area and encourages moving from one area to another, creating the psychological impression of more room. Grand structures will have the opposite effect, so dividing the area should be done with more subtlety, such as using a different paver or laying pattern for each area, or using border pavers to separate the spaces. Related: What’s Missing in your Landscaping Layout? One of the cleverest ways to visually expand an area (and create extra space for plants) is to go vertical. If the vertical space in your small backyard is abundant, use it to distract from the lack of horizontal yardage. Add vines, a living wall decorated with flowers, and other colorful greenery on your retaining wall, fence, or railings. A ladder can be an attractive decoration that will freshen up the space with its chic appearance and you can use its rungs as shelving for flowers or other decorative elements. Your vertical space is a great way to draw the eye up and outwards and create a different experience in your backyard. Having a centerpiece in your backyard draws the attention away from the lack of space. The focal point can be a dramatic piece, like a water feature or a fire pit that will create interest and add intrigue. The size of the focal point determines whether the space will appear larger or even smaller. It is recommended to choose a smaller focal point for smaller spaces because a larger element, like a bold fireplace design, may overwhelm the space and have the opposite effect. After you divide the small backyard into functional areas, unify the space using similar hardscape materials. Incorporate elements with similar textures and contrasting or complementary colors that will highlight the greenery. Light colors and large format pavers are ideal for visually enlarging the area. Another way to expand the area is to incorporate diagonal lines. Avoid creating short, straight lines on your deck or patio. Instead you can have the pavers laid in a diagonal orientation. When you are dealing with a smaller backyard, it is crucial to avoid cluttering it with an overflow of furniture in different colors and textures. It is a better option to keep it clean and simple with minimal furniture in preferably neutral or light tones that suit the area. Landscape professionals recommend elevation changes in smaller backyards because it makes the space look larger. For your backyard, you can keep it straightforward and create different heights with a raised wooden deck, adding retaining wall terraces, or including a layered arrangement of plants of various heights. This entry was posted in Design & Construction and tagged Backyard, Focal Features, Landscape Design, Outdoor Rooms, Paver Patterns on October 16, 2017 by 12850420. 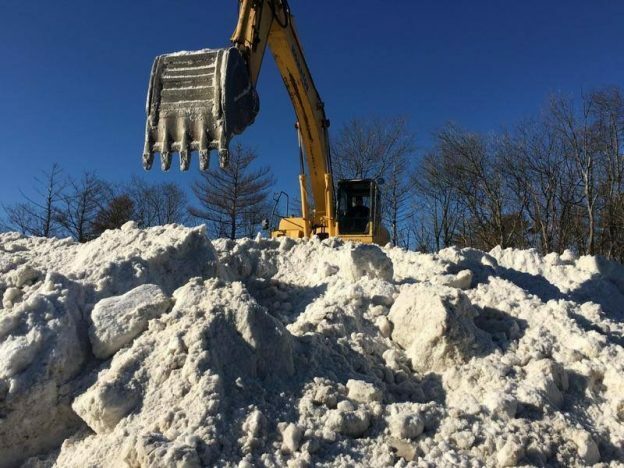 Have You Found a Commercial Snow Removal Company for Your Duxbury Property Yet? The colder months approach, and in Duxbury, MA, this fact means snowfall. Dealing with accumulated frozen precipitation is often an endeavor that requires professional assistance. Choosing the right company shouldn’t be attempted without an adequate look into its qualifications. The risk to your property as well as adequate snow removal demand a company that has the experience and credibility to offer assured, quality service. Dealing with the accumulated snow on your property will require either removal or plowing of the snow on the ground. Most homeowners concentrate on driveways, walkways, and other functional areas of the landscape, and most properties have a space where a hill of snow can rest until spring. The specific choice will depend on the needs of your property, budgetary choices, and other preferences. Towne Tree and Landscaping can help you with commercial de-icing, ice control, relocating piled snow if needed, snow blowing, shoveling, and sidewalk clearing and maintenance, as well as offer certified snow reports. Because dealing with snow can affect the quality of your landscape, choosing the right company is important. While you might think of it as simply moving snow, the heavy-duty equipment used can harm the ground, especially if it’s soft due to moisture. Rutting the ground, affecting underground pipes, and other damage are all potential consequences. Chemicals and salts which are often used to melt snow can also damage plantings and affect the quality of the soil. To make sure that snow removal efforts don’t damage your landscape, book with the same company responsible for your regular grounds-keeping to maintain a continuity of awareness of your landscaping needs, and make sure that the company chosen is qualified, experienced, and committed. Towne Tree and Landscaping conducts snow and ice management with the same sensitivity to the environment as we do with landscaping and maintenance. We understand that waiting around for snow removal isn’t an option when you have a life to lead. Being able to safely enter and exit your driveway and walkway are the reasons for booking the service, so Towne Tree and Landscape endeavors to anticipate your needs and act accordingly. You must also make sure that the company has the needed insurance. As previously indicated, this job isn’t without danger or risk to your property. Before signing on the dotted line or booking a service for snow removal, check that the company has an appropriate level of insurance as well as any required bonds or licenses from the municipality. Towne Tree and Landscaping can offer this documentation upon request to give you peace of mind. Perhaps the most telling indicator of whether you should book with a company for snow removal is the reputation of the company. While in-person, firsthand accounts are more credible, verified online reviews are also helpful; although, it’s helpful to remember that all can’t be considered. The need for snow management is predictable, so making an informed, thoughtful decision is totally possible and should be expected as one more aspect of preparing for winter. This entry was posted in Snow Removal and tagged Landscape Maintenance, Landscaping Services, Snow Removal on October 13, 2017 by 12850420.